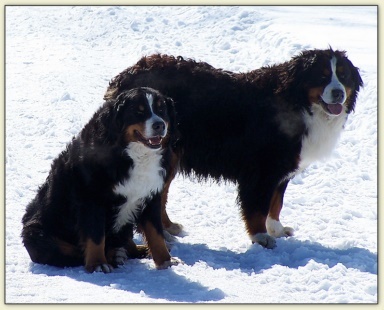 Here's our Bernese Mountain Dogs who are also our constant companions and family members. They share our home with us, living inside the house with us. During the day, they love to follow us around the house and yard, they also love to go on their regular walks and hike in the woods on our land in the country or even come horseback riding with us. Our 'Belnois' Bernese Mountain Dogs perfectly combine beauty, intelligence and the so pleasant desire to please of this wonderful working companion breed. Our Bernese Mountain Dogs have lots of fun and receive great results in many different canine activities with us. They earn multiple championships and titles in conformation, obedience, rally-O, drafting, agility and/or canine good neighbour! We thrive to have our dogs honored as 'BMDCC Versatility Dogs'. Thanks to our selective breeding program that only choose the best ones to be 'parents' for our 'Belnois' bernese mountain dog puppies (with the best ancestors), our 'belnois' adoptive families will also have the great happiness to own a puppy who inherited the following wonderful qualities from our 'Belnois' Bernese Mountain Dogs : beauty and nice structure, intelligence, pleasant to work and live with, quick learner, cooperative and loyal temperament, a solid and good healthy life ! To have more information on our wonderful bernese mountain dogs, selected to be 'parents' for our 'Belnois' puppies, visit their individual pages below. Click on a picture to access the pages to find more detailed information on each of my Bernese Mountain Dogs. 1. First of all, in top priority, HEALTH. Without any exceptions at all, our bernese mountain dogs have to be declared FREE of hip AND elbow dysplasia, with proven certification from a specialized organization, like OFA (www.offa.org), OVC and/or Pennhip (www.pennhip.org). Our bernese mountain dog also has to be certified CERF (http://www.vmdb.org/cerf.html) clear of any eye problems. Also, when we choose to breed one of our bernese mountain dogs, we make sure there is no bad genetic problems, like dysplasia, for at least 4-5 generations by checking more than 30 dogs behind in the pedigree and gathering the most information on ancestors and brothers/sisters. At that moment, we can really see a huge drop in genetic health problems and malformations when the gene is absent for at least 3-4 generations. We do everything possible to produce, at first, bernese mountain dog puppies with EXCELLENT health and longevity backgrounds that will make them the BEST family companions! We also, produce puppies that have nice potential for the conformation and/or obediance and/or draft titles, but we will never neglect health and temperament for these aspects. Beware!!! Too many breeders neglect and breed with dogs who are affected of dysplasia or with their offspring, without caring of the health incidences that will affect their puppies and the sadness it will bring to all the families who will adopt those puppies. From any breeder, please always check all health clearances and information of the parents and their pedigrees of all puppies who are offered to you before you take a decision! 2. Also, our bernese mountain dog has to have the great temperament knowed for this breed: social, docile, calm, affectionate, loyal, willing to work and be useful, gardien without ever being agressive. Any degree of agression, as so little or worse, or any degree of extreme shyness, should be considered a serious fault for a breeding Bernese Mountain Dog. The temperament is, first of all, genetic/inherited, that afterwards can be influenced from birth, by education and socialisation throught the dog' s life, but his temperament background that was passed to him from his genetics will always have an influence. 3. 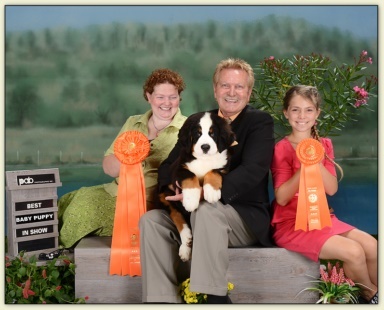 And, our Bernese Mountain Dog has to correspond to the highest breed standards determined by the Canadian Kennel Club. Without any exceptions, all our bernese mountain dogs that we decide to breed answer to all these health, temperament and beauty criterias. At that moment, we know that we will produce the Highest quality puppies, with excellent health backgrounds, long life span, that will deserve to be part of good families to bring and share joy and tenderness for many years to come. Also, some of my berners are co-owned with wonderful families (see their individual pages), this gives the opportunity for these 'Belnois' berners to have their own family life with a loving family and gives us the chance to have acces to more quality lines for our mothers and fathers of our puppies without having too many berners under our roof and to offer the best quality family home to the ones that we keep with us. Since we wish to keep our berners as family pets in our own home and not have a kennel, we must limit the number of our dogs that live with us, but we need to have many quality lines to have the best breeding program for the best puppies. I greatly Thank the families who co-own with us and offer the best family home for our berners! They were carefully selected and answered many criterias. Please contact us for more information on my dogs and their pedigrees. We will love to share and talk about our dogs with you, we can also tell you about their parents, grand-parents, etc. Copyright (C) 2004-2018. All rights reserved. Last update MAJ Sunday, September 30, 2018 Website created by Veronique Matte-Paquet, 'Belnois' Bernese Mountain Dogs.